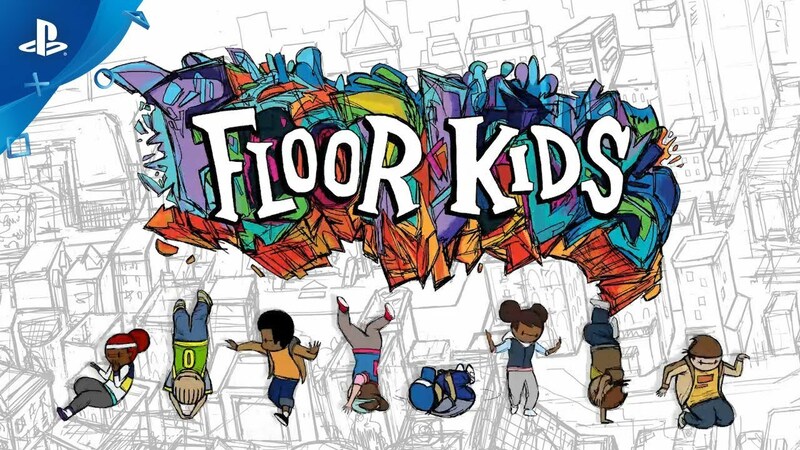 On behalf of my team, I’m really excited to announce Floor Kids, a funky hand-drawn breakdance game, featuring an original soundtrack, and an emphasis on freestyle moves and self expression. 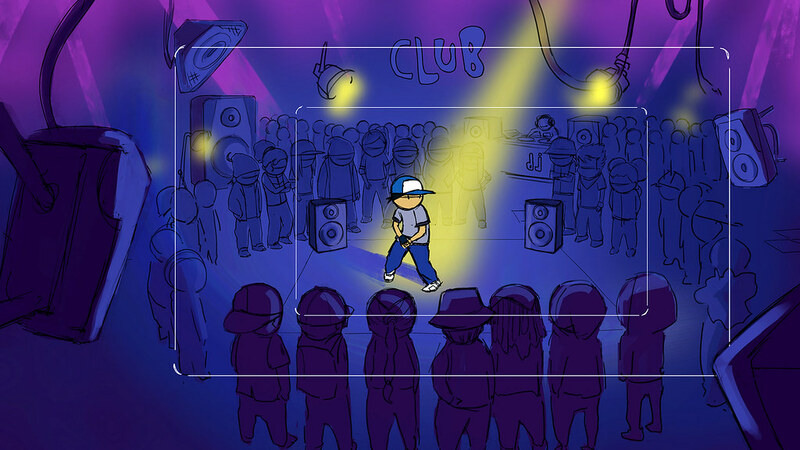 I’m JonJon, the creator and animator of the Floor Kids characters, and a lot of my best friends are bboys. So how did I get here? I moved to Montreal in 2004 and while working on some short films in my round-head-dot-eyes style, I was also getting involved in the local break scene. I gained entry to a small 4-man crew, hidden in the shadows of the city. Each crew member covered one of the basic elements of – Power, Freezes, Toprock and Footwork. I was more the footwork guy. Relying on ideas from my drawings to try to invent movements to impress my friends. In a flash of spontaneity, my two passions came together. I started animating my sketch-style character with realistic bboy moves and spunky attitudes. No video reference. From the moment of creation, I knew there was some kind of a hook to the concept, because I couldn’t stop laughing and having fun with it. I had met Kid Koala through the animation scene in Montreal and as we were hanging out one day, I showed him a couple stacks of animation that I had tested of Noogie and O-Live, and I flipped it for him at 24 frames per second speed in front of his eyes. He lost it. And by that I mean, he was just blinking and staring into space, deep in thought. He broke the silence. Later I would find out that it was the album titled “Your Mom’s Favorite DJ”. We made the promo project official with the help of Ryhna Thompson, Kid Koala’s long time collaborator. I got to work finishing a small series of animated bboy clips. The world of Floor Kids was born. Floor Kids made a little splash on the internet, and did a short stint touring animation festivals, like the Brooklyn Animation Block Party. I also remember being at the practices and a few of the bboys would show up with their PSP rocking a brand new game called B-Boy. It was the wildest thing ever, featuring big names in the international break battle scene. A lot of the knew that I was also doing my own brand of break animation so they would show me. To me, the game B-Boy for PSP and PS2 will always be the pinnacle of breakdancing games for the bboys & bgirls of the community, because it comes directly from one of the most influential, original bboys of all time: Crazy Legs of the legendary Rock Steady Crew. B-Boy the game will always be the first, and most comprehensive of its kind, and we didn’t try to replace it. I never would have thought that we would come full circle with Floor Kids, just over 10 years later, reaching the level that we are on the brink of launching on PS4. 1) it’s fun. 2) It’s FUN. 3) IT’S FUN!!! With those technicalities aside, whilst developing our game, we wanted to approach everything with style, so that the game would be an interpretive vision between two artists. The visuals, with eight never-before-seen characters, and the music, over 40 original tracks. The idea was to make something fresh & original from our own memories and experiences of the eras that we grew up in. I will always be primarily a visual artist. That’s my bread & butter. But having the opportunity to make this game reminded me that I’m also a bboy at heart, who still has things to accomplish. To me, the breaking artform is about many things. It’s about expression. It’s about telling a story with your steps. It’s about proving to yourself what is possible. It’s about competition and respect, but respect that must be earned by giving everything you have… and then some. It’s about creativity and invention. The element of surprise. Levelling up your skills. It’s about seeking more knowledge. It’s about you and your friends, and having fun. And it’s about having the freedom to find your style. 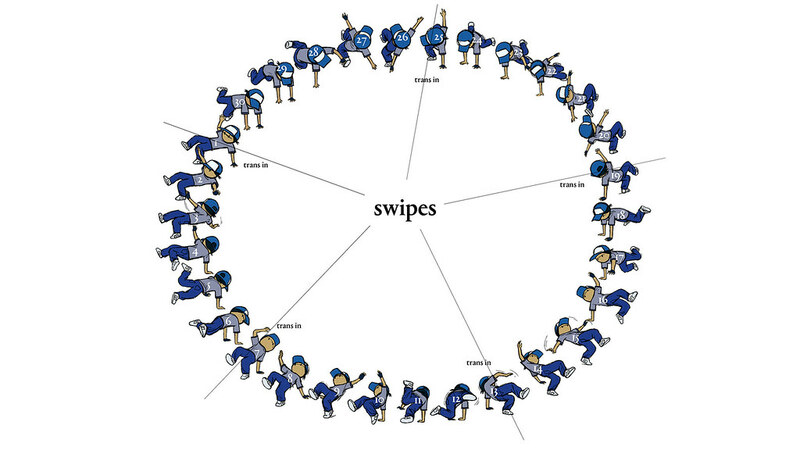 Combo hints are located on the backs of the character recruit cards and are instrumental in achieving the highest scores. Cards are located in the Break Deck, accessible from the map screen in Story Mode. Infinity Mode lets you practice and master your combos without the pressure of fixed time. Discover the hidden Strobe state during power moves by spinning the left analog stick faster to accelerate your spin, when at max speed, repeatedly press the analog stick like a button to S-T-R-O-B-E! Earn extra Flyness points by adding holds and poses to your routine by pressing L1 or R1 during top rock or down rock moves. Add flyness hops to your freezes by pressing L1 and R1 during a freeze. Love this on Switch. Real fun game. Yooo this does look really fun! Never really thought about the concept of a breakdancing before, but now that I think about it, it makes a lot of sense. I’ll definitely be checking this out!